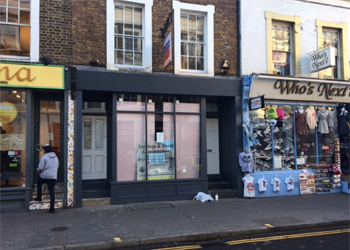 The property is situated on the western side of Pembridge Road, which at this point enjoys a very heavy pedestrian flow carrying tourists from Notting Hill Gate underground to the Portobello Road. Other retailers located in the block include Superga, Yates Buchanan, Bubbleology and Gelato Mio, with Amorino and Starbucks opposite. View location map. £75,000 per annum exclusive, payable quarterly in advance, subject to upward only review at the end of the fifth year. A new full repairing and insuring lease is available for a term of 10 years. Each party to bear their own legal costs in connection with the grant of the lease; incoming tenant to bear both parties professional fees in connection with any Licence to Alter. An EPC will be commissioned on completion of works–copy report and recommendations available on request. The local authority has verbally informed us that the rateable value for the premises is £52,500 and the rates payable for the current year ending 31/03/18 are £15,261.50. Interested parties should make their own enquiries and confirm: - Royal Borough of Kensington and Chelsea business rates department 020 8315 2082. The property is opted and VAT will be charged in addition. Immediate upon completion of legal formalities. Important Notice: Measurements are approximate and no responsibility is taken for any error, omission or mis-statement in these particulars which do not constitute an offer or contract. No representation or warranty is given either during negotiations, in particulars, or elsewhere. Unless otherwise stated all rents and prices are exclusive of VAT, where applicable.